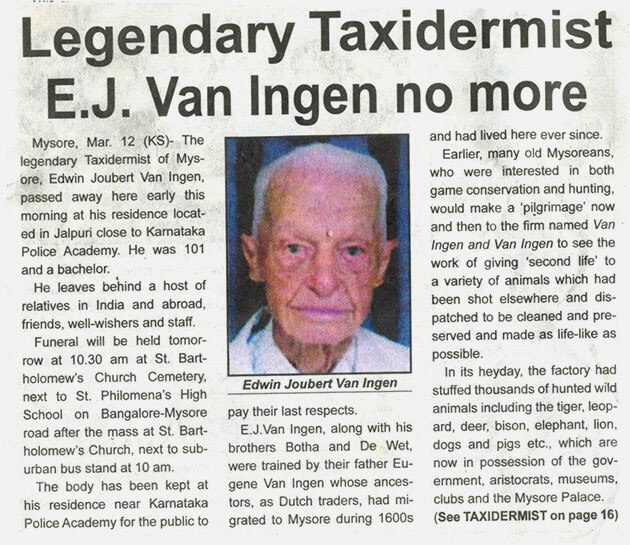 In March of 2013, the last surviving member of the famous taxidermy family Van Ingen brothers passed away in Mysore, India at the age of 101. His death marked the end of what may have been the largest taxidermy studio in the world, but the saga of his life and legacy is far from over. Today, a full five months after his death, controversy still surrounds the circumstances of this renowned taxidermist’s final days. At stake are several Van Ingen’s properties including a sprawling house on a two-acre plot in Mysore and a 270-acre coffee plantation in Kerala, which are reportedly worth more than 50 million US dollars. When the 101 year-old bachelor Edward Joubert Van Ingen apparently died without a heir, things began to get complicated. Even though it has been 66 years since the British colonialists ruled India, the Indian government says they have the right to confiscate the property under the archaic Foreign Exchange Management Act, which allows them to seize assets previously owned by foreign ex-patriots. The Van Ingen family is of fourth-generation British descent, not Dutch, as had been widely reported in the media due to their name. How strange to think that a man could be born in India and live there for over a century, yet still not be considered a local! In March, newspapers all over India announced the death of the country’s most famous taxidermist. 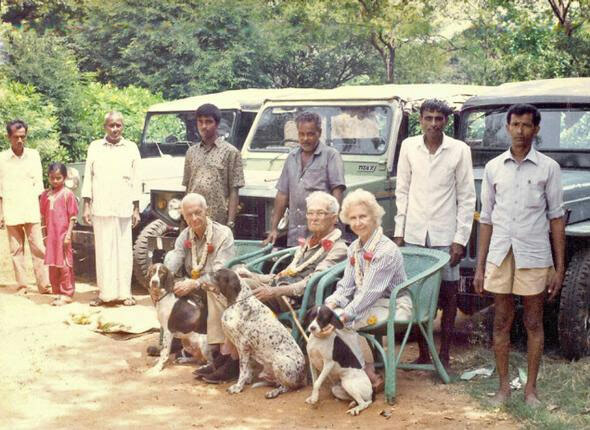 The second bizarre twist in this story came when Michael Eshwar, a local real estate tycoon and horse trainer, who claimed to be Van Ingen’s adopted son, took over his assets, including a bungalow in Mysore and several acres of vacant land around it immediately following Van Ingen’s death. This raised suspicions form the local authorities when they learned that the day before his death, Van Ingen had gone to the local police in Nazarbad and lodged a complaint alleging that Eshwar had forced him to execute a will in his favor. The next day he died in his home. Since then, Michael Eshwar disappeared for a while, but has recently resurfaced to loudly complain the police officials have implicated him in a false case. Meanwhile, Van Ingen’s surviving relatives, the children of his three brothers and a sister, who live in India, the UK, France and Canada, were unaware of the controversy and the adoption. They have only recently gathered information about the police case through the media and have begun to formulate a course of action. The “300 Crores” that the video keeps referring to is a unit of measurement of Rupees. 300 Crores is the equivalent of about 65 million US dollars, which is what they estimate the Van Ingen estate is worth. To add to the confusion and sense of urgency, many of the priceless works by the late taxidermist Edwin Joubert Van Ingen, including vintage collections of mounted animal trophies, as well as ivory and hides, could be rotting in his locked home. With the trophies not tended to for the past five months, the rains and the damp weather of a real Indian summer could wreak havoc with them. 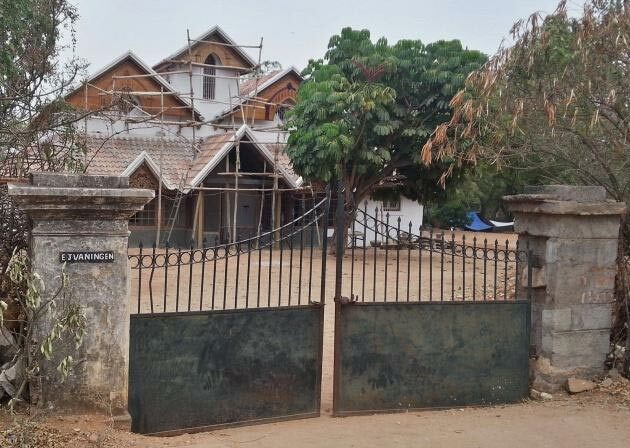 “Bisal Munti”, the disputed family bungalow of the Van Ingens, which has been locked for five months while priceless trophies inside may be rotting in the Indian climate. In 2004 World Taxidermy Championships lecturer and British professor and taxidermy researcher Dr Pat A. Morris travelled to Mysore, India to document the legendary taxidermy factory by interviewing the last survivor of the business Edward Joubert Van Ingen. Morris would go on to author and publish the book “Van Ingen & Van Ingen – Artists in Taxidermy” in 2006 which outlines the history of what once was one of the world’s largest taxidermy firms. The book also contains actual photocopies of the factory workbook records of the Van Ingen work flow. In the 1930s, the Van Ingen taxidermy factory employed over 100 workers and may have been the largest studio in the world. Edwin Joubert Van Ingen was a world-renowned taxidermist, whose family had migrated to India before he was born. His mounted trophies adorn the palaces of royals and are still on sale at auction and art houses all over the world. The family’s taxidermy studio, Van Ingen & Van Ingen, was established in the 1890s, and operated continuously over one hundred years until closing in 1999. In their heyday in the 1930s, the studio would regularly process over 1000 big cats each year. The firm Van Ingen & Van Ingen was started by Eugene Melville Van Ingen in in the nineteenth century. 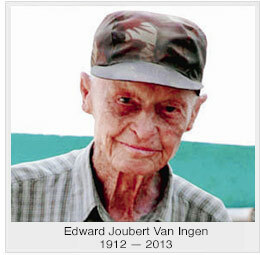 After his death in 1928, the studio was managed by his sons, John de Wet (1902-1993), Henry Botha (1904-1996) and Edwin Joubert (1912-2013), until it shut down in 1999. A fourth brother, Kruger, seems not to have been active in the taxidermy business. Edwin Joubert Van Ingen and his brother Botha Van Ingen are seen together in this photograph taken in the early 1990s. Van Ingen & Van Ingen’s work was synonymous with quality and fine workmanship. They constructed all the molds, mannikins, glass eyes, tongues, teeth and even whiskers for jobs of all different sizes of big cat skins and hunting trophies that customers would bring to them. The “snarling” open mouth expression of finished big cat mounts was one of the Van Ingen’s trademark qualities, a feature rigorously studied and made possible only by special concrete head molds which had specific grooves built on the nose area. 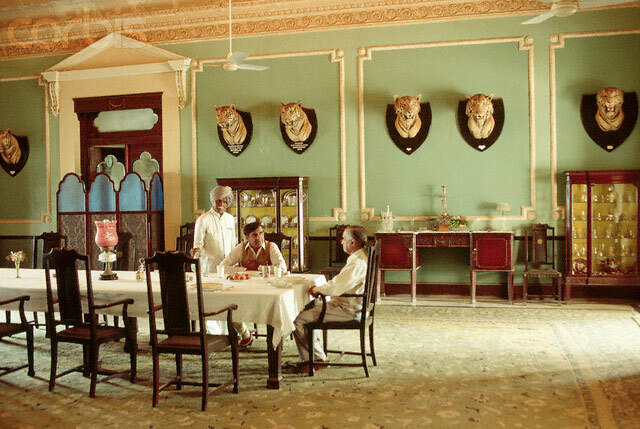 Multiple mounted tiger heads from the Van Ingen studio adorn the wall of an Indian palace. The Maharajha of Kotah placed a single order for 20 tiger heads in 1932. Glass eyes blanks were imported from Germany, and hand painted individually by a factory workman. Each pair were said to be painted specifically for each individual taxidermy mount. Van Ingen constructed mannikins and molds of all sizes so they could produce mounts of consistent quality for a variety of poses from head mounts to full mount life size pieces. 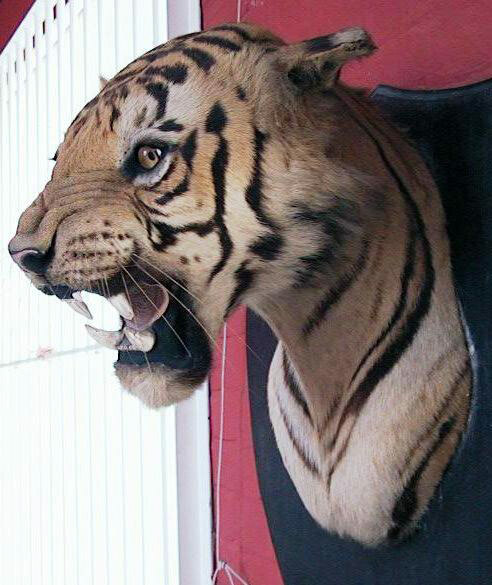 The typical Van Ingen snarling tiger head on a plaque mount was the main product from the world’s largest taxidermy “factory”. Van Ingen taxidermy products are located all over the world; in private collections, natural history museums, and palaces. One of the finest collections of Van Ingen work is, unfortunately, not available for public viewing as it lies sequestered at the Mysore Palace. A special permit is required to visit the trophy room, which has mounts and shields of several tigers in various poses, bears, lions, wild boar, elephants, assorted deer, rhinoceroses, crocodiles and leopards. There are also African animals such as giraffes and zebras. 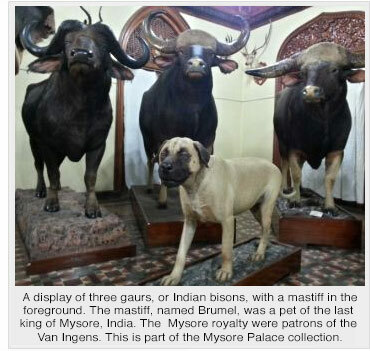 The Mysore Maharajahs were great patrons of the Van Ingens, and there is also a mount of a pet mastiff called Brumel, a favorite of Jayachamarajendra Wodeyar, the last ruler of Mysore, in the trophy room. A huge collection of Van Ingen mounts housed at the Mysore Palace. Unfortunately, members of the public are rarely allowed to see this display. Photo by Vikhar Ahmed Sayeed. 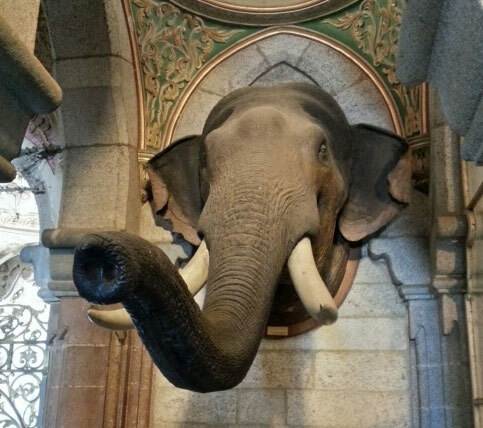 A Van Ingen elephant head from the Mysore Palace collection. Photo by Vikhar Ahmed Sayeed. 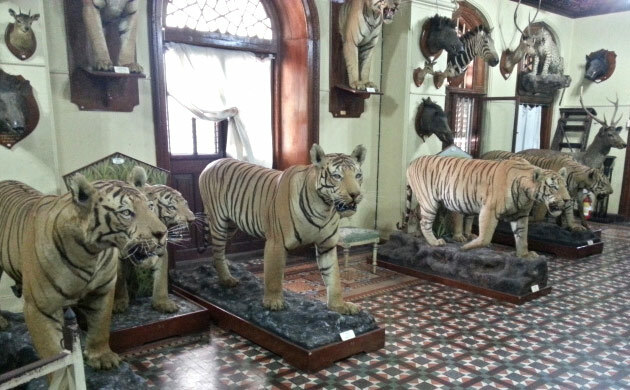 The Regional Museum of Natural History in Mysore is another place where several Van Ingen mounts can be seen (including perhaps what could be a mount of India’s last cheetah, shot in 1947). John Thomas, a taxidermist at the museum, marveled at the quality of the Van Ingen products but pointed out that their method differed slightly from that of modern taxidermists as the factory operated like an assembly line, handling hundreds of skins, whereas a contemporary taxidermist would work on one model at a time. A modern taxidermist would also prepare a mould to fit each specimen perfectly, whereas Van Ingen’s papier-mâché manikins made from concrete molds came in pre-fixed sizes. Van Ingen was also the author of several how-to books explaining and illustrating proper field care for trophies and taxidermy displays. In case you are wondering about “The Preservation of Shikar Trophies”, the word “shikar” means sport hunting in India. Vintage works from the Van Ingen studio regularly are offered for sale in art auctions and on line. You can still purchase taxidermy items, books and photographs from the Van Ingen collection at the website Van Ingen Mysore Collectors located in Australia. Antique mounted leopards and tigers are available for sale since they are certified CITES Pre-Convention. But alas, they are not available for sale to the USA.